I have an LMS 5100 mini lathe. I'm noticing a patern on parts turned using power feed -- can't feel it but I can see it. The patern looks like a spiral drawn with a thin pencil. The spiral has a pitch of 16 TPI, the same as my lead screw. My assumption is that lead screw rotation is causing slight changes in tool pressure against the part being turned. Does that sound right? And more important, what can I do to reduce or eliminate the issue? I do make sure that the half nuts are engages with the carriage as far to the right as possible before tightening the right lead screw bracket. That is about all I've done with respect to lead screw and half nut adjustments. I think the only thing the lead screw can move in a manner to cause what you describe is the carriage. How long has it been since you adjusted the carriage retaining plates? Have you checked the lead screw for embedded swarf? Another thing you might try is to engage the half nuts with the carriage sitting in the “work zone” with the machine turned off and loosen the apron mounting screws and let it “center” itself on the lead screw and retighten the mounting screws. Then readjust the right lead screw bracket. I’m not familiar with your lathe, but that worked on a different brand mini-lathe that I had. Hope you find the culprit. I know it can be frustrating. The carriage retaining plates were adjusted last week when I finished the modification to use studs and nylocks in place of the socket head cap screws. When I first made the change I didn't have any m6 nylocks and was using nuts with wavy washers, instead. When I switched to the nylocks I removed the lead screw. It was well cleaned before being re-installed. I like your idea of looking at the apron mounting screws with the half nut in the work zone before adjusting the right lead screw bracket. Thanks. I think I'm also going to try to rig up a test indicator to see if I can see rhythmic movement in the carriage when the feed is engaged before I make any changes. If I can do that then I'll be better able to see what makes changes and what doesn't. I've got a .0005 test indicator. I hope that is enough. A)I loosened the two clamping pillow blocks that hold the lead screw, re-adjusted the lead screw in such a way that when the half nuts was closed, it would not move the lead screw up or forward. B) Re-adjusted the apron and the saddle which was a bit too loose . 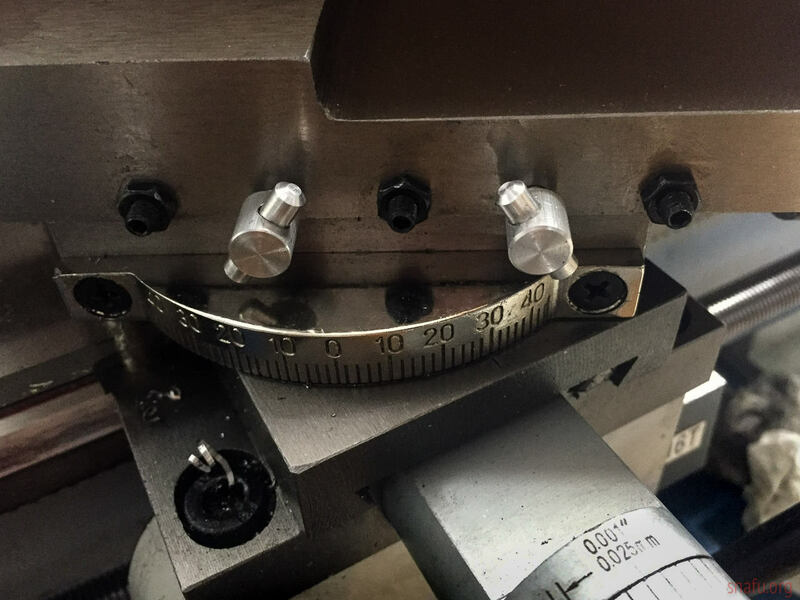 C)Played with the cutting tool position by moving it from being perpendicular to the workpiece to left/right, (away from the tailstock or the chuck), found the sweet spot . I did all the steps in one shot so I can not tell you what actually fixed the problem, I also started using a very sharp cutting tool that a friend had made for me which made a world of difference in the finish and the overall look of the parts. Anyhow, this is what happened and that's how I dealt with it. as they say ,your mileage may vary. I guess Higgite posted while I was typing, it looks like we are on the same route. Thank you, Ken. Half nut pressure makes sense. I see I can make adjustments to the half nut, but I don't want to touch them until I do the other things you and Tom suggest. I'm saying that because I don't have any feel for how they should be adjusted so don't want to mess with them until I've ruled out other causes. I'm going to assume they are OK for now. Another thought. Does the pattern only show up on heavy cuts or finishing cuts or both? If it didn't do it before you made the mods, wondering if the nylocks might be flexing. Ken has a good idea about adjusting the left lead screw pillow block as well as the right one. Also, I would check again for swarf that may have found its way to the lead screw since you cleaned it, if you haven't already. I'm seeing the patern in both light and heavy cuts. I think the pattern has always been there, although not quite as noticeable in the past. Right now I'm leaning toward apron/lead screw alignment as a potential cause. I'll have some time to play this afternoon and will apply some of the above suggestions top see what happens. I'll write up what I find this evening. Better protection for the lead screw is on my list of needed future improvements. I've been thinking of getting the telescoping lead screw cover for my 5200 but I'm not sure if it'll be more of a nuisance than actual upgrade, so far I've been getting by using a brush and whisking the swarf away. I re-adjusted the apron near my common working area of the lathe. It may have been canted slightly to the plane of the lead screw. I then made sure the pillow blocks were in the appropriate location with each saddle as close to the block as possible and the lead screw engaged. I think things are better, but I could still detect a slight pattern if I looked hard on some scrap, unknown steel that I used as my test piece. I was taking .005 depth of cut using an HSS tool. As a further test I changed to large radius form tool and took a couple of thousands skim cut. I could not detect that pattern after that cut. Marc, it sounds like you are on the right track, I would continue playing with the cross slide adjustments a bit more and get rid of any play if there's any, I have no slop in mine and still it manages to slide though with some extra persuasion from me.